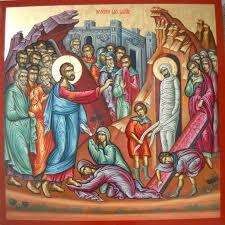 Lazarus Saturday. Orthros and Divine Liturgy. BRETHREN, let us be grateful for receiving a kingdom that cannot be shaken, and thus let us offer to God acceptable worship, with reverence and awe; for our God is a consuming fire. Let brotherly love continue. Do not neglect to show hospitality to strangers, for thereby some have entertained angels unawares. Remember those who are in prison, as though in prison with them; and those who are ill-treated, since you also are in the body. Let marriage be held in honor among all, and let the marriage bed be undefiled; for God will judge the immoral and adulterous. Keep your life free from love of money, and be content with what you have; for he has said, “I will never fail you nor forsake you.” Hence we can confidently say, “The Lord is my helper, I will not be afraid; what can man do to me?” Remember your leaders, those who spoke to you the word of God; consider the outcome of their life, and imitate their faith. Jesus Christ is the same yesterday and today and for ever. Then Jesus, deeply moved again, came to the tomb; it was a cave, and a stone lay upon it. Jesus said, “Take away the stone.” Martha, the sister of the dead man, said to him, “Lord, by this time there will be an odor, for he has been dead four days.” Jesus said to her, “Did I not tell you that if you would believe you would see the glory of God?” So they took away the stone. And Jesus lifted up his eyes and said, “Father, I thank you that you have heard me. I knew that you have heard me always, but I have said this on account of the people standing by, that they may believe that you did send me.” When he had said this, he cried with a loud voice, “Lazaros, come out.” The dead man came out, his hands and feet bound with bandages, and his face wrapped with a cloth. Jesus said to them, “Unbind him, and let him go.” Many of the Jews therefore, who had come with Mary and had seen what he did, believed in him. Palm Sunday. Orthros and Divine Liturgy.